(CBS) Two California men are urging Netflix to stop streaming “13 Reasons Why” because they say teenage girls in their families committed suicide after watching the series. The show does carry warnings for its graphic depictions of violence but these suicides raise new questions about whether the labels are enough. 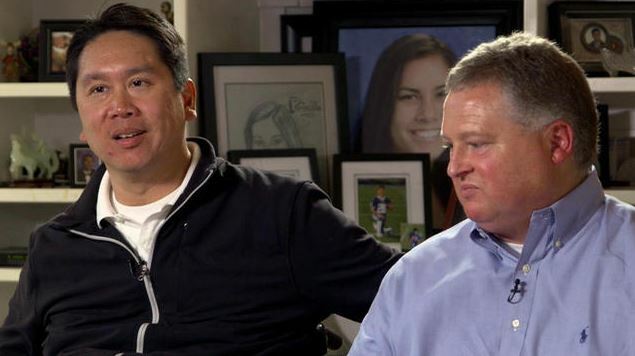 The two men who had never before met in person, are now supporting each other in their grief, CBS News correspondent John Blackstone reports. “Every day I look at Belle’s picture, and I give her a kiss, and I say ‘I miss you, baby,'” said John Herndon. “My Bella did suffer from depression,” Herndon said. “I started reading about the signs a little too late,” Chiu said. The series shows the lead character Hanna taking her life after leaving audio tapes describing the “13 Reasons Why.” Herndon and Chiu knew their girls were troubled, but they didn’t know they had watched the show until after they died. “So Netflix is showing children how to commit suicide,” Chiu said. “They provide a blueprint for that action. I agree with Peter. That is totally irresponsible,” Herndon said. “13 Reasons Why” executive producer Selena Gomez has defended the show for a teenage audience. “It hits a very important part in me, and I think this is what they need to see. I want them to understand it,” Gomez said. Clinical psychologist David Swanson does not believe the show can trigger a suicide. “Anxiety, depression and huge life stressors are the triggers for suicide,” Swanson said. “Really, you’re going to tell me that showing the tragic, dramatic death of a 15-year-old girl is supposed to provide some kind of, some kind of venue for a discussion?” Herndon said. Herndon says he’d like to meet with Netflix to convince the network to stop showing the first season and cancel plans for season two. “My question to Netflix would be, did they take into account any potential negative impact that season one has had?” Chiu said. “We’re getting through this as a family,” Herndon said. The two men have one hope: saving other families from losing someone young and vulnerable.